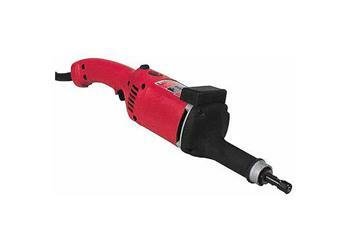 This Milwaukee Die Grinder offers more power for heavy duty jobs. The 5196 comes with a 1/4 inch collet but will accept 1/8 inch collet as well. A full array of mounted points allows you to grind many shapes and diameters. At 14,500 RPM with an 11 amp motor, this tool attacks even the toughest grinding jobs. A maximum 2 inch reinforced or non-reinforced wheel can be attached to this versatile grinder for deburring and shaping larger work pieces. Operated by a trigger switch on the back handle. For mounted wheels and points up to 2 in., reinforced wheels up to 2 in. Maximum Capacity Mounted Wheels and Points 2"